Karl Lagerfeld is embarking on a serious throwback for AW16. We’ve fallen in love all over again with the eternally chic 11.2 which, this season, comes in a laser treated faded denim. Giving us the chance to be both practical and stylish, Lagerfeld’s treated us to a whole range of flap bags, shopping bags and a backpack, all with ultra-light traditional Chanel quilting. The Girl bag has transformed to a clutch, coming in quilted leather or tweed so you can get whatever suits your fancy. The bag is more than a pretty face, its numerous pockets make it super functional and its detachable chain means it can be worn over the shoulder or used as a clutch for the tamer of soirées. You can go leather, lizard or python with your evening clutch, and with chains made of leather, metal and fantasy pearls, there’s a bag for every evening eventuality. The 2.55 is back in aged and metallic leather (or you can opt for the overstitched beige suede split calfskin), and was inspired by the original toiles used in the ateliers, and comes with it’s own mirror for when you’re on the move. Lacing is also a big feature in the collection; having been inspired by corsetry on dresses and boots from the AW16 RTW collection, and contrasts with the leather and tweed of the handbags. The collection hit boutiques in September so go grab yours! 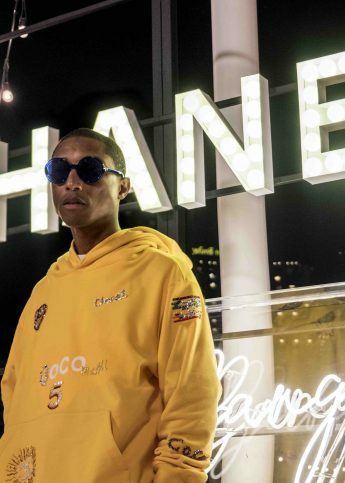 Watch Pharrell spill the tea on his new capsule collection with Chanel.